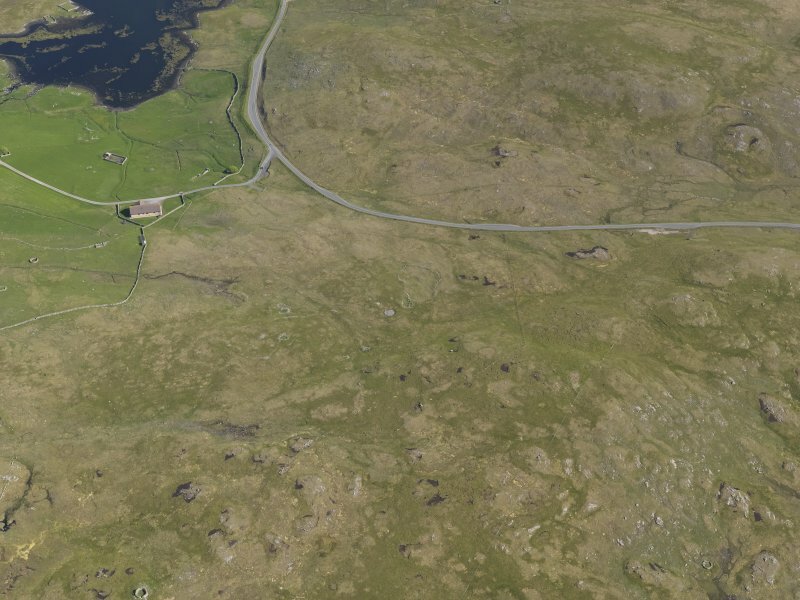 General oblique aerial view with Brouster in the foreground and the Loch of Voxterby and Brace Field in the middle distance and Burrafirth beyond, looking N.
Plan of settlement. Published in Current Archaeology 1979,VI,no.65 . 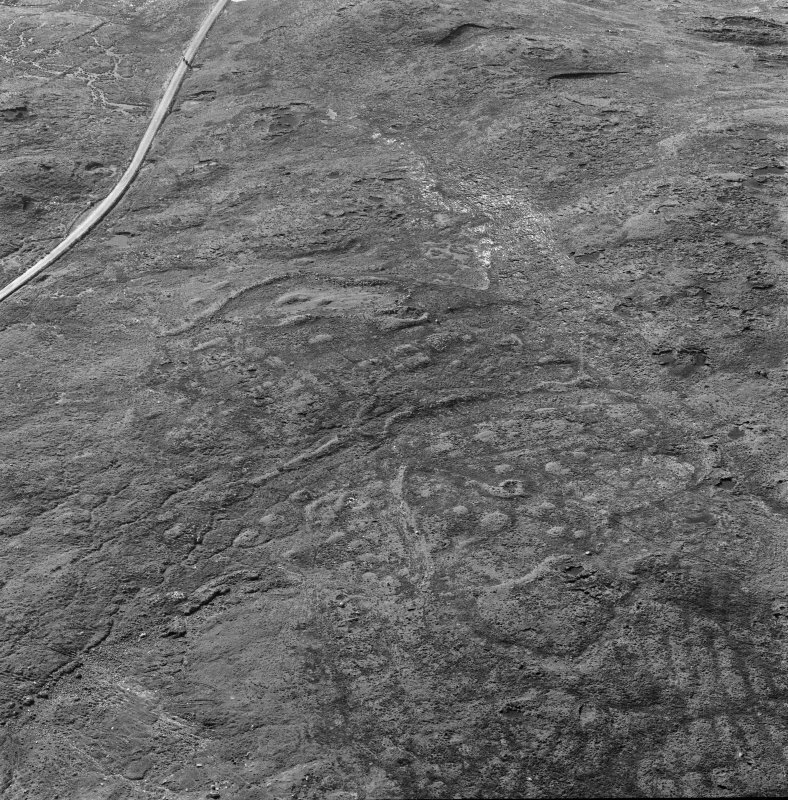 Oblique aerial view of Scord of Brouster, looking SE. HU 256 515. 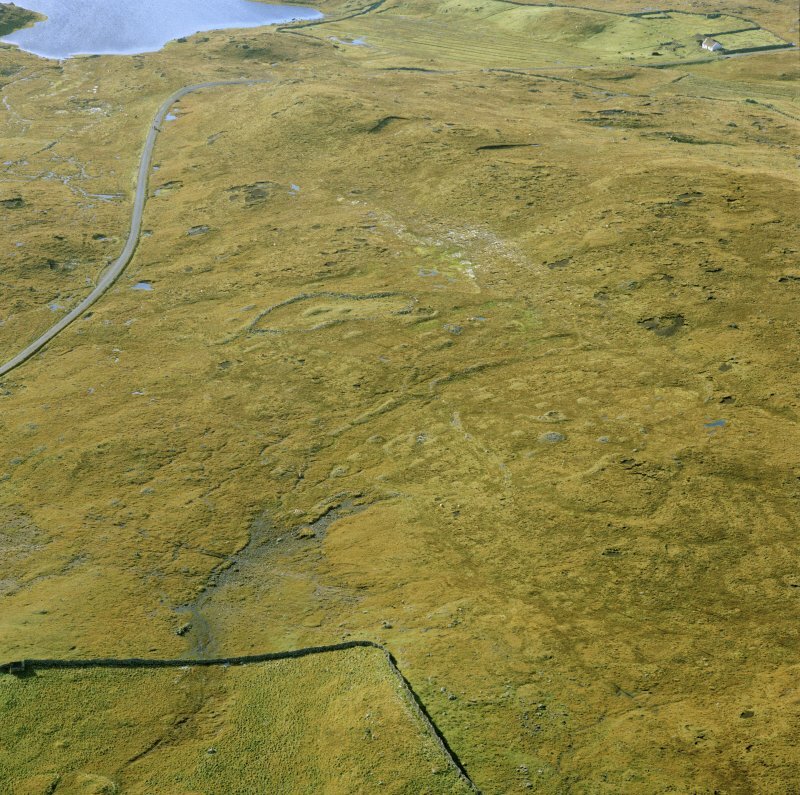 The remains of a Neolithic house ("A") occupy a site on the slopes of the Scord of Brouster, a short distance north of the road between the Bridge of Walls and Walls, and about 300yds WSW of Brouster. 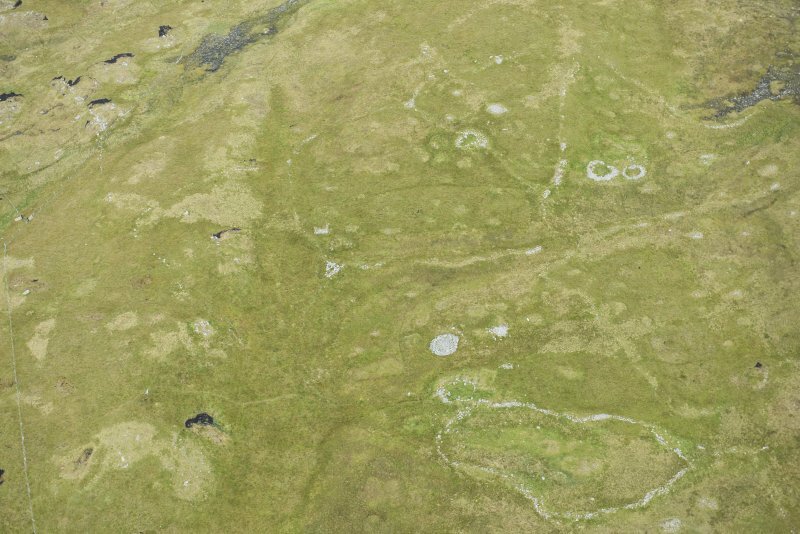 The house is represented by an oval, grass-covered bank measuring about 43' NW-SE and 34' NE-SW externally. A gap in the SE of the bank represents an entrance passage. A field system attached comprises five or six fields, the boundaries of which are much-denuded but definite in some parts and traceable in others. One dyke, better preserved than the others, over-rides the house walling, but may simply be a rebuilding on the old foundations. The field enclosed by this boundary shows cultivation rigs and there are field clearance heaps in all the fields. About 26' north of the house there is an oblong dry- stone construction, now deep-set in the soil, which may be original: it measures externally 23' by 19'. 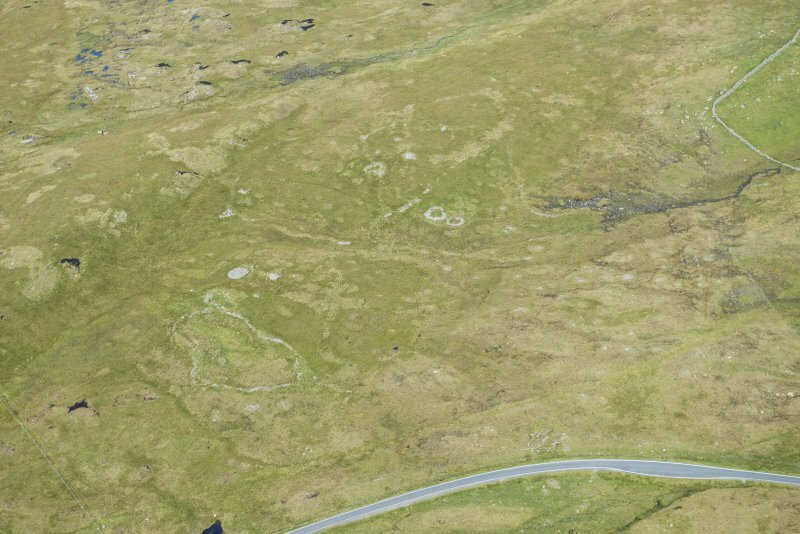 Two other sub-oval constructions ('B' & 'C') are located in the north-most fields and may also be contemporary. They take the form of grass-covered stony banks and each encloses a hollow. In overall dimensions they average 35' by 27' and the spread of the bank is 7' to 8' in width. These sizes suggest they may be adjuncts to the house, but they could be small houses. C S T Calder 1958. 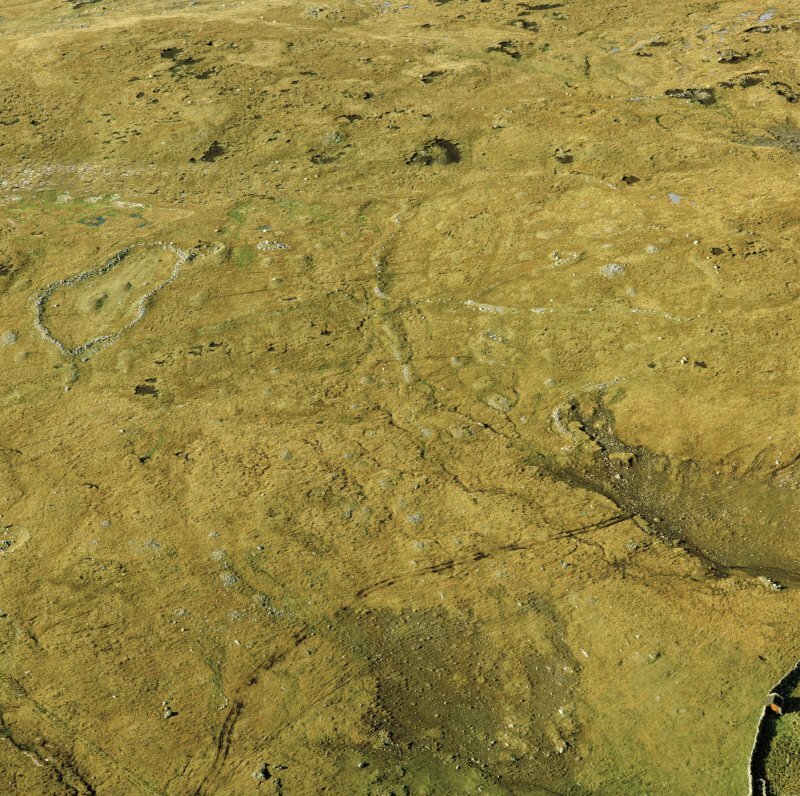 'There is a superficial suggestion of the Stonydale "Temple" (HU25SE 1) in the shallowness of the recesses and the flattened SE end of the ruin.' 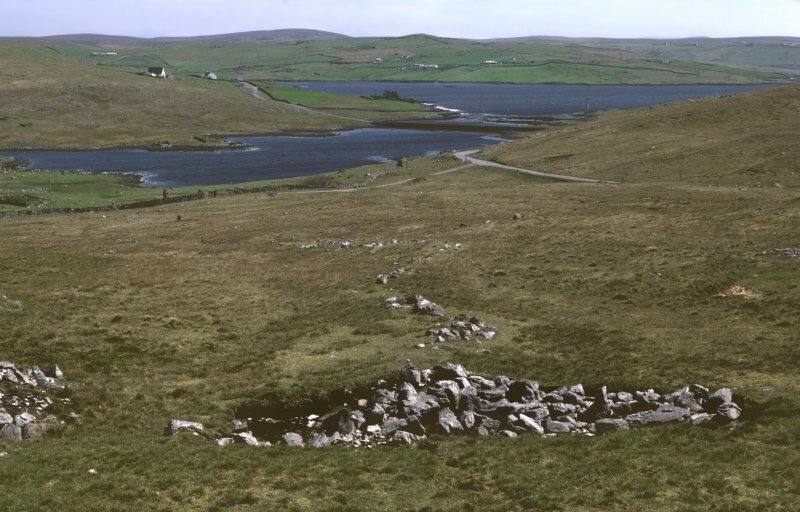 The sub-rectangular stony mound may be a cairn or a building. 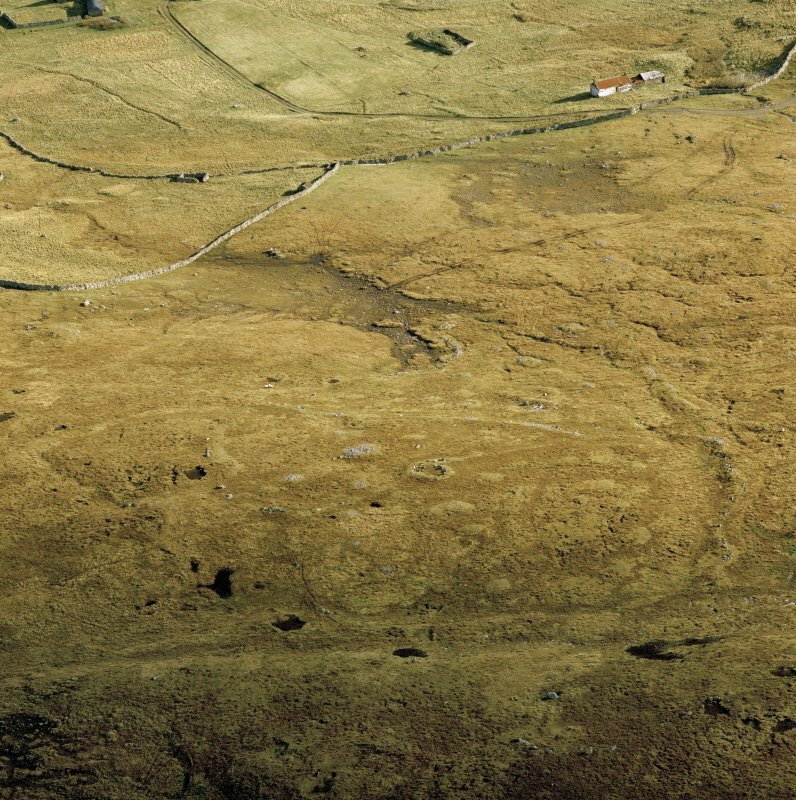 A Neolithic/Bronze Age settlement and field system,as described by Calder, centred at HU 255 516, comprising two homesteads (A and B), and one probable homestead (C). The "oblong construction" 26' to the north of homestead A cannot be classified: it may be fairly modern. Visited by OS(NKB) 20th June 1968. 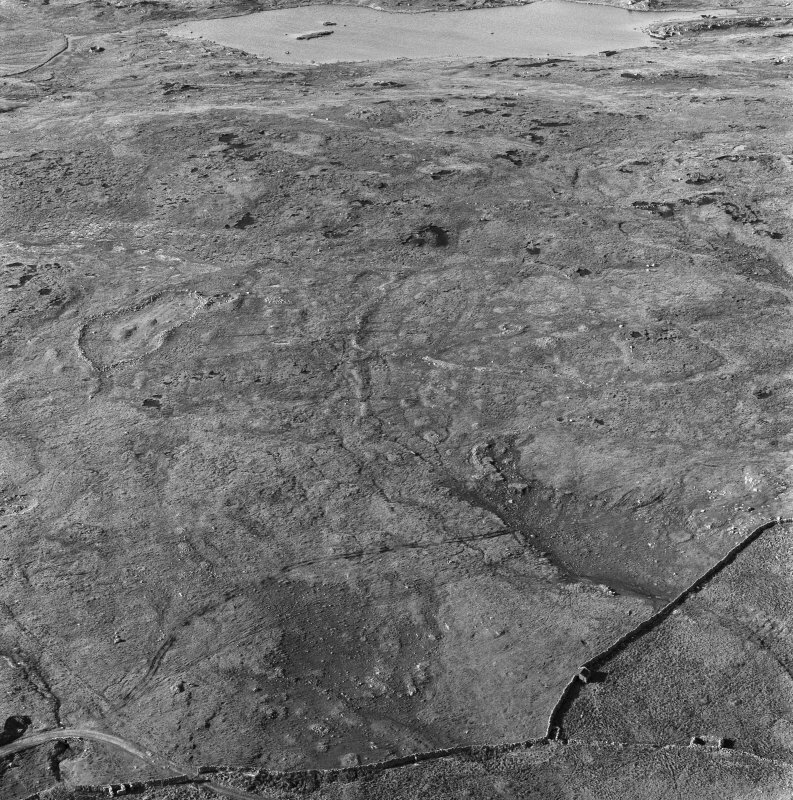 Oblique aerial photographs of Scord of Brouster, Shetland, taken by John Dewar in 1973. 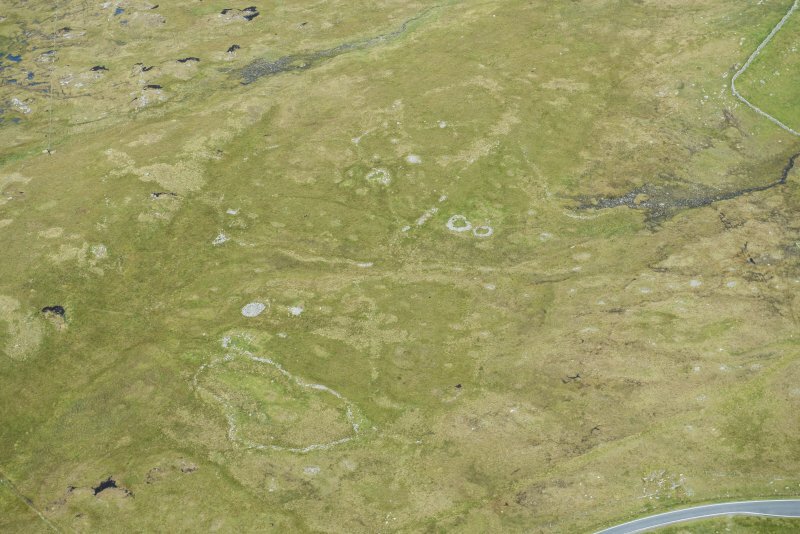 This is perhaps the most complete and comprehensible neolithic settlement complex in Shetland (colour photograph on p.28). 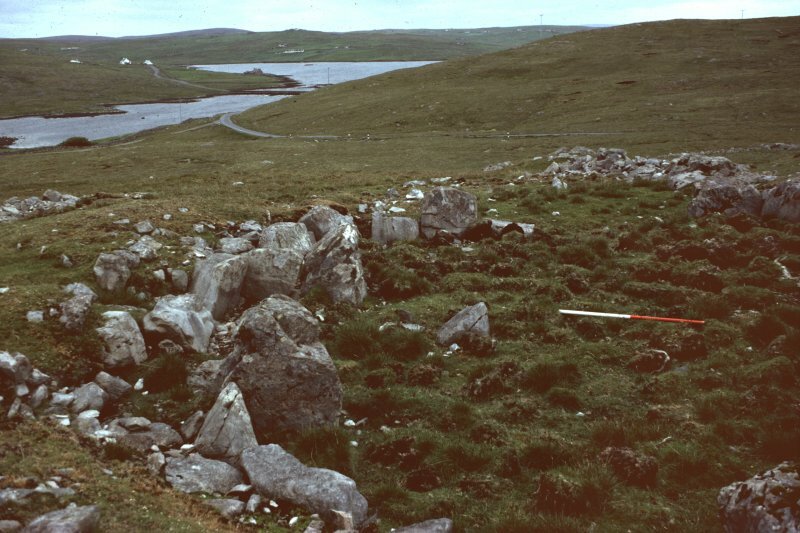 The outlines of the houses, the enclosures and the many clearance cairns are readily discernible, even from the road, and recent excavations have laid bare many details of the settlement. 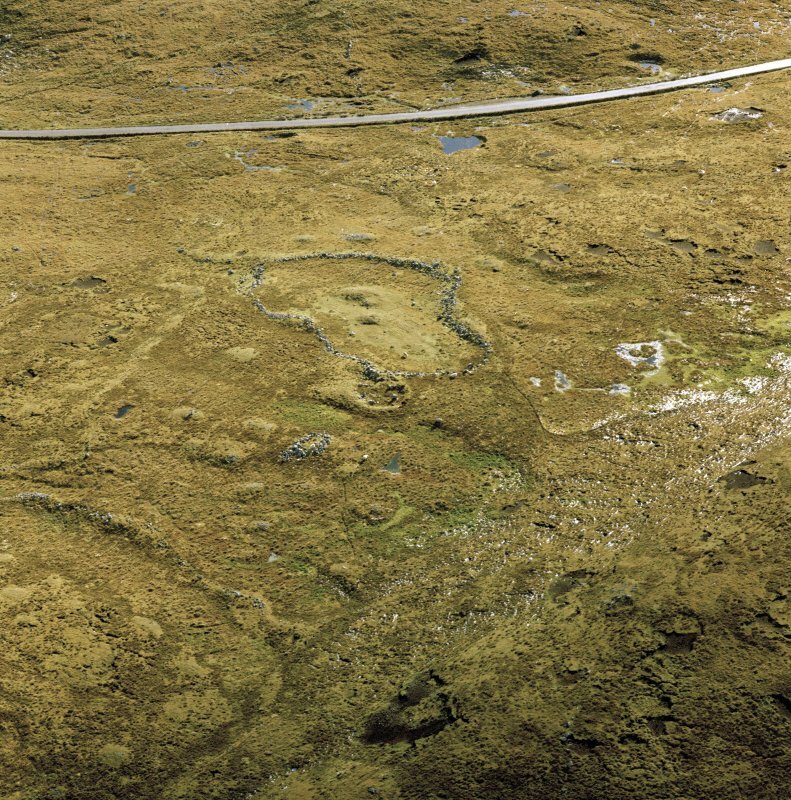 The most obvious enclosure is close to the road, an irregular oval almost 60m long enclosed by a stone wall, and a large oval house is attached to its north end. The entrance is at the downslope end of the house, and the interior, 7m by 5m, contains a central hearth and stone-built cells lining the walls, using massive boulders as subdividing piers. 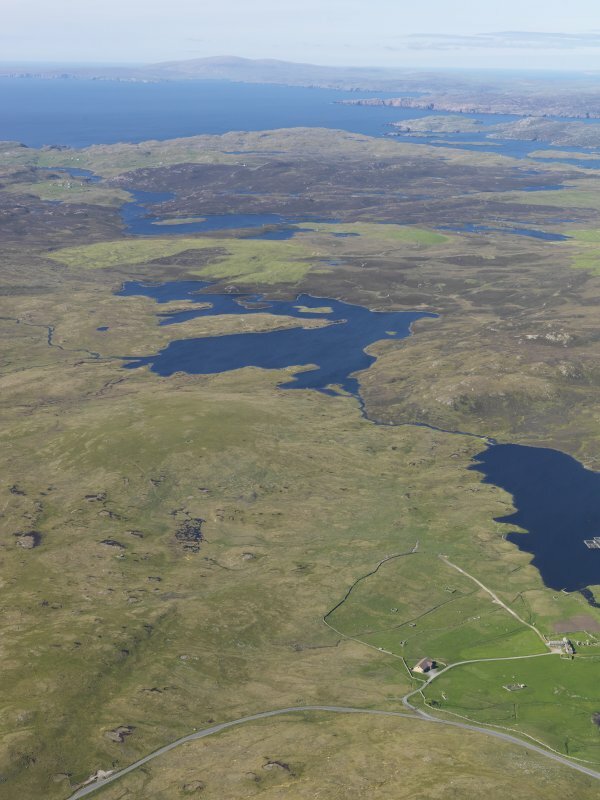 A radiocarbon date places the occupation of the house in the late 3rd early 2nd millennium BC, but the site as a whole is likely to span a long period. 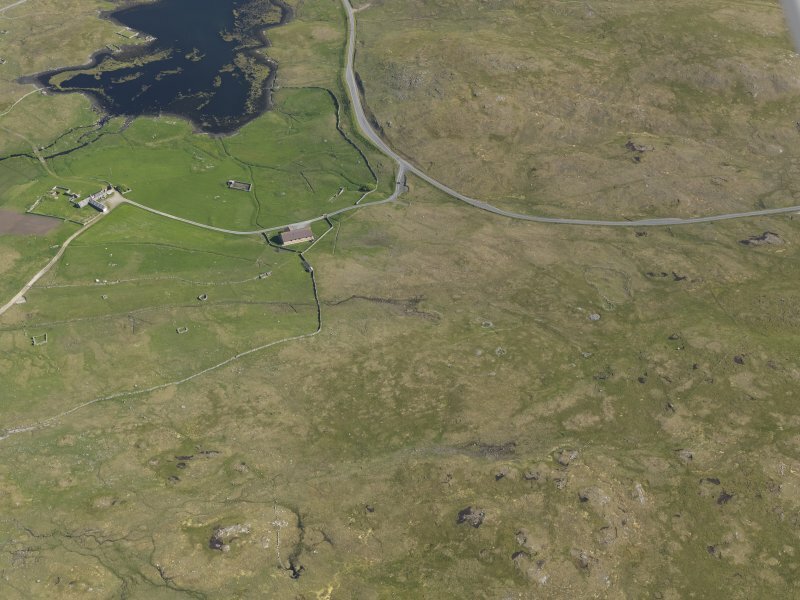 At least three other houses lie further north, and their fields cover an area of about 2 ha. 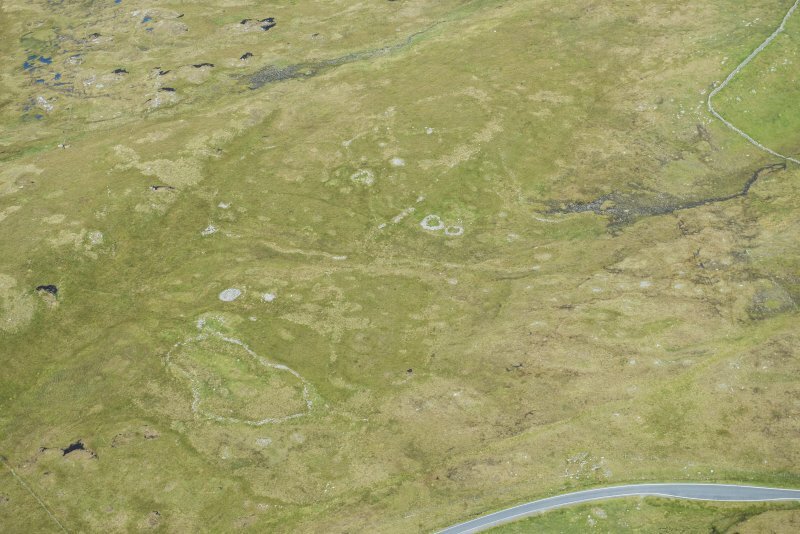 Close to the first house is a perfect circular ring cairn with a kerb of large boulders, bur radiocarbon dating suggests that this may be considerably later than the settlement, perhaps by one and a half thousand years. 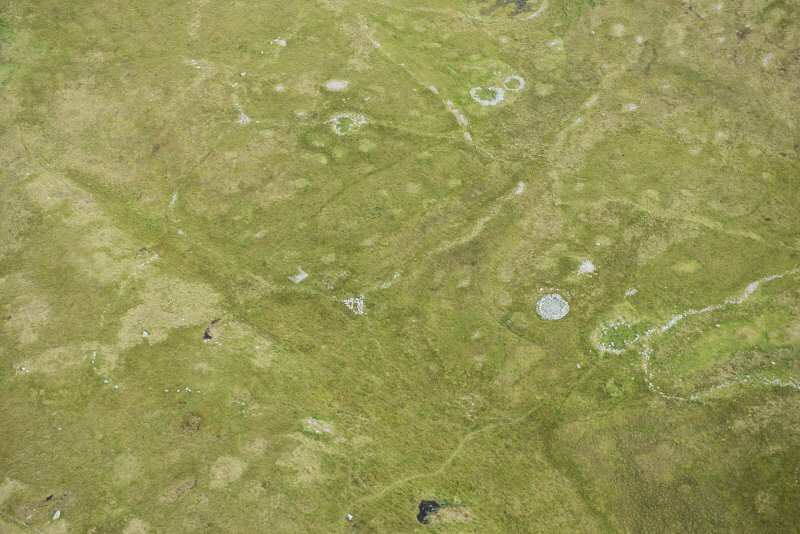 The field-system at Scord of Brouster comprises eight irregular conjoined enclosures, clustered together to form a roughly oval block. 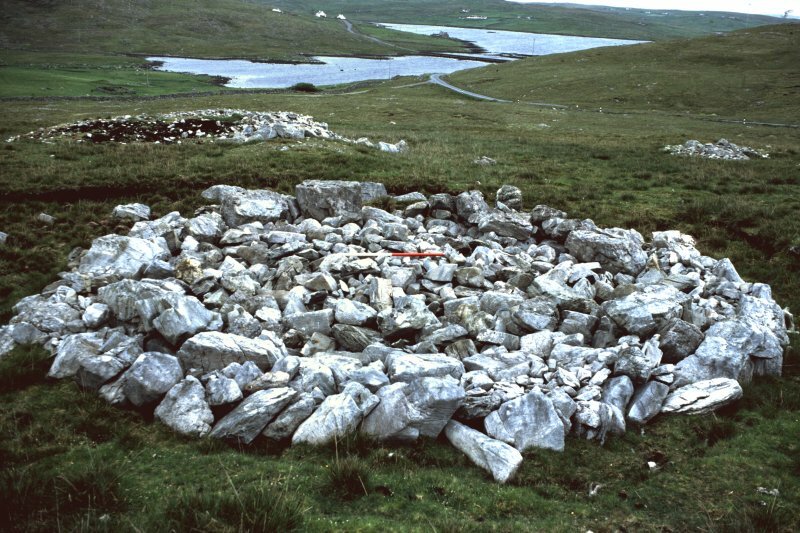 Scattered across the interiors of six of the field enclosures, and extending beyond them to the east, there are over 60 small cairns, presumably field clearance, some arranged in rough lines. 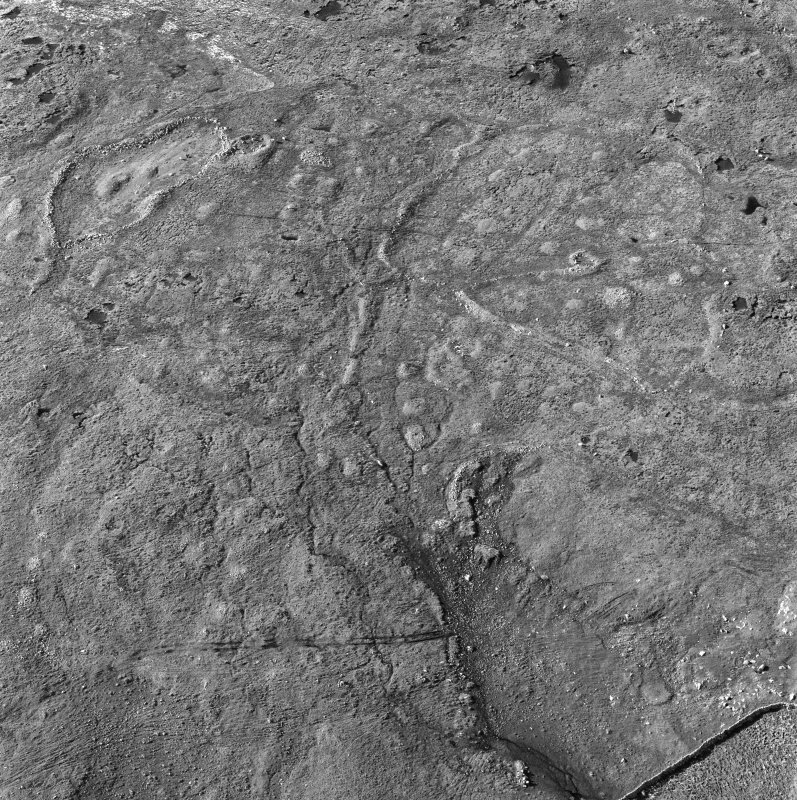 The western extent of the fields is relatively straight and its line is continued to the N by a boulder bank that extends for about 130m before it forms a T-junction with a boundary that cuts across the parts of the saddle between the Mousa Water to the W and the Brace Burn to the E. To the S, the western extent of the Scord of Brouster fields aligns roughly with a field boundary that ends towards the field-system on Gallow Hill (HU25SE 37) and may form part of an extensive boundary system beyond (e.g. see HU25SE 603).